Increase your fruit and vegetable intake this season with this extremely easy spring salad. This colorful salad is so well-balanced, and is filled with essential nutrients your body needs to function. Not only that, it has a mix of savory, sweet and juicy flavors to satisfy your taste buds. Enjoy as a side salad or as main dish. Wash hands thoroughly before beginning. 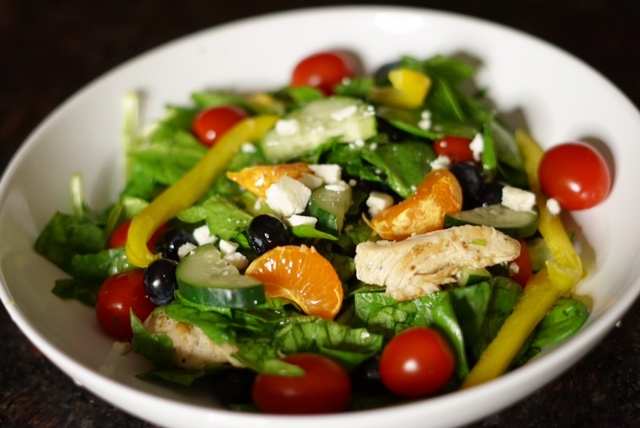 In a medium sized bowl using your hands or tongs, add spinach, blueberries, tomatoes, cucumbers, chicken, mandarins, yellow peppers. Add feta cheese crumbles and olive oil (or your favorite dressing).